Ants prefer lawns which are patchy and in a bad condition, so first prize is to ensure your lawn is well-maintained. Spray with a contact insecticide or apply granular ant bait (which will be carried to the nest) to eradicate the nest. 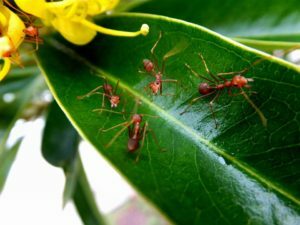 Note: If your plants are full of ants, leave them – they are after the aphids that are infesting your plants and so, are a natural protector. Visit your local GCA garden centre for advice on the best insecticide or bait.